Our surroundings affect us, and they affect people in vulnerable situations even more. 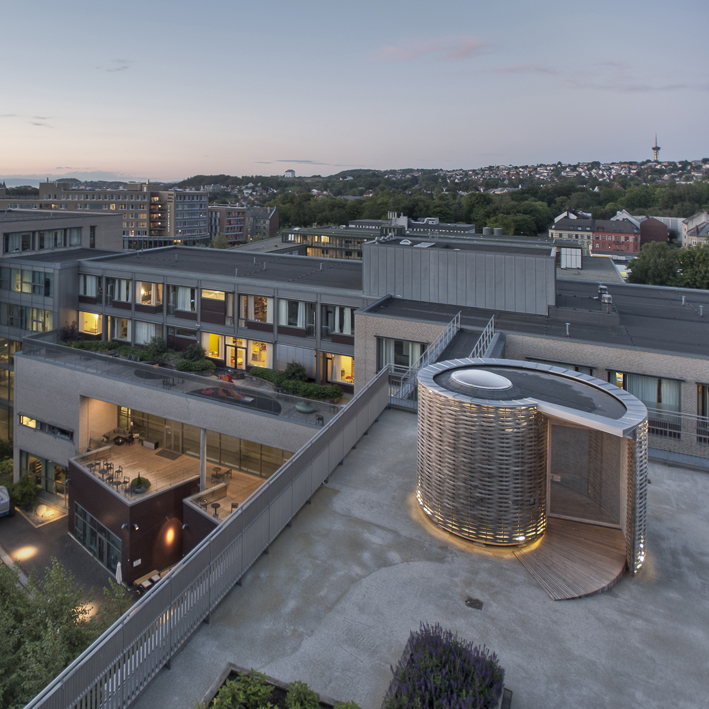 FRIrom is an independent, conditioned 9 m2 wooden pavilion, located on a roof terrace of the Women and Children’s clinic at St. Olav’s Hospital in Trondheim. FRIrom strives to be a place with a good atmosphere, where relatives can find peace and feel safe during vulnerable situations, a place where one can enjoy silence and be without restrictions and distractions of other surroundings. During the design process we reflected back on some of the “original” instruments that affect us; light, sky and natural materials. 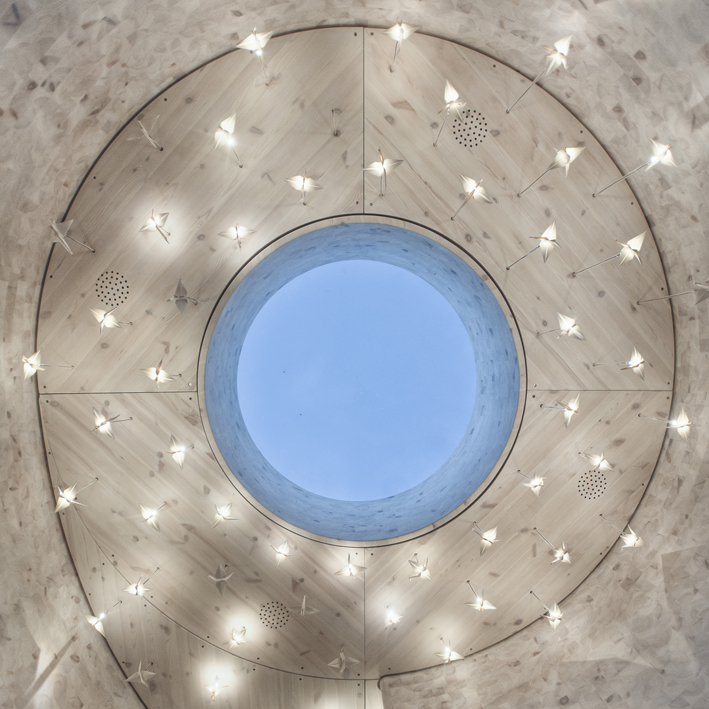 The pavilion is shaped like a spiral with an inner circular space. The shape encloses and gives one control over the environment. 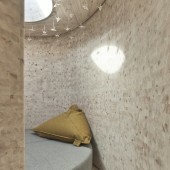 A mattress fills the circular space; a flexible piece of furniture, which, together with a large pillow, provides the user freedom of movement. The experience of FRIrom varies throughout the day and year. 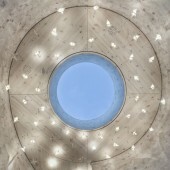 During the day the centered skylight puts focus on the sky and the light that is constantly changing. When darkness comes, the lit origami ceiling becomes more visible and one gets a feeling that the room ceiling has been lowered. Origami is an ancient Japanese art form associated with happiness and hope. Children, relatives and collaborators have folded cranes as a symbol of planting hope in FRIrom. FRIrom is built entirely from Norwegian wood. All solutions are unique and designed specifically for this project. Using a digital model, the wood has been milled out of 50mm thick sheets of laminated Pinewood. The annual growth rings in the wood create a variation in the expression of the wall, where no spots are equal. Floor and roof construction have been milled out of solid wood panels, also Pine. The pavilion is insulated with Hunton wood fibre insulation, which is recyclable and has a heat storage capacity that is double that of normal mineral wool. The facade is braided from Aspen, a strong wood that is pliable enough to be woven. After the first year of completion of FRIrom, we see that it has been well used and that the users have made it their own. Friend visits, physical treatment, alone time as well as timeouts for employees are just some of the examples of how the space has been used. Our wish for the future is to obtain funding to establish a FRIrom also at other hospitals. 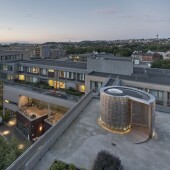 FRIrom has been an educational springboard for us as practicing architects. We wanted to create architecture that one can touch, feel and experience, and which contrasts to many other spaces and experiences in a hospital. It is architecture that we hope will make a small difference to the people it is meant for. Idea: Mads Abelsen Bøhle, nurse at the Children`s clinic, St. Olavs Hospital. Can we, through work with form, light and materials, create a space that feels safe as well as facilitates the expiry of different reactions?